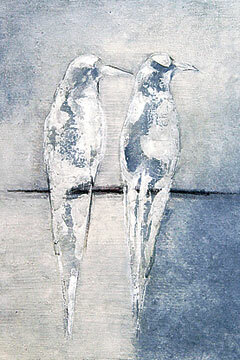 The works, by Jodi Endicott, are part of "Beasts to Birds," showing at Hawaii Pacific University Art Gallery through Friday. 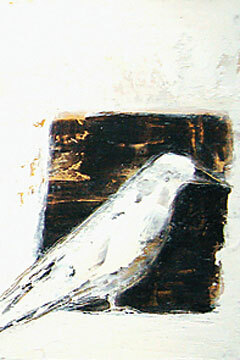 Above, one panel of a three-panel painting titled "White Bird 1-3." Jodi Endicott presents mixed-media sculpture and paintings in "Beasts to Birds," showing through Friday at Hawaii Pacific University Art Gallery. Endicott layers multiple materials on canvas for three-dimensional paintings that convey motion and nuanced mood. Her "menageries" on canvas include horses, dogs and an abundance of birds. 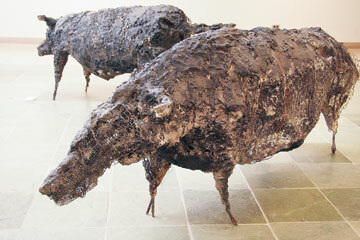 Sculptures include almost cuddly looking rabbits, and large boars that embody the strength and raw power of the animal. The university's press release says "Endicott uses animal imagery, metaphorically enriched, to represent statements about society. Her artwork may first appear humorous and then, on closer inspection, present a stronger statement about the world at large." Hawaii Pacific University Art Gallery is located in the school's administration building lobby, at 45-045 Kamehameha Highway in Kaneohe. Gallery hours are 8 a.m. to 5 p.m. Mondays to Saturdays. Call 544--0287. 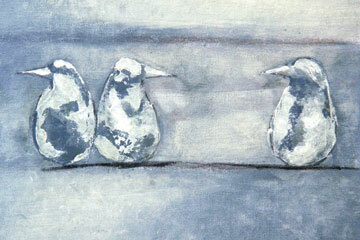 One of a group of bird paintings titled "Blue on White." 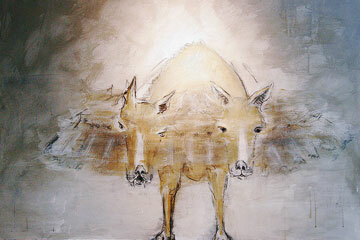 "Dog of Two Faces," is a mixed media on canvas. 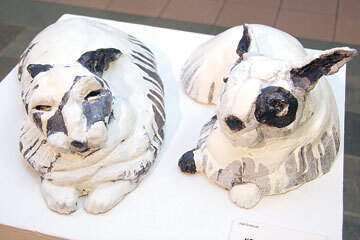 Two of the artist's "Rabbits" mixed-media sculptures. Another work that's part of the "Blue on White" group of paintings. 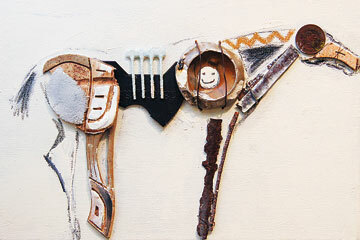 "Horse of Rubber Sole" is a mounted piece Endicott created with found objects.